The Royal Order of Selected Enthusiasts or R.O.S.E. is a major fundraiser. No meetings; just an upfront donation. Funding for our all community built float comes from many different fundraisers, but becoming a R.O.S.E. can really make a difference. We want to thank all the people, businesses and other groups who have signed up to become a member. Please support and thank them when you see these people around Battle Ground. If you would like to become a member of this wonderful group of people, please see the information below. Members may join as a single, couple, family, community organization or business. There have even been “pets” as members! Bonus: No meetings to attend and a thank you display ad, listing all R.O.S.E. donors will be published. Battle Ground Senior Citizens Center, Inc. The R.O.S.E. 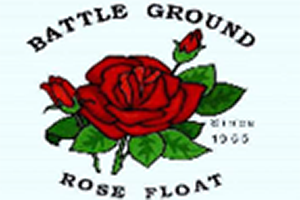 (Royal Order of Selected Enthusiasts) is a special collection of people who make possible Battle Ground’s float entry in Portland, Oregon’s Rose Festival Grand Floral Parade. Anyone who contributes $100 or more can be a R.O.S. E. member. Donations of $250 to $499 are a Silver R.O.S.E. and Donations of $500 or more have membership in the Golden R.O.S.E.